D5 Blog continues. Today listen to the D5 in action and learn about Nikon’s latest blunder. Sony Adds Two FE Lenses. 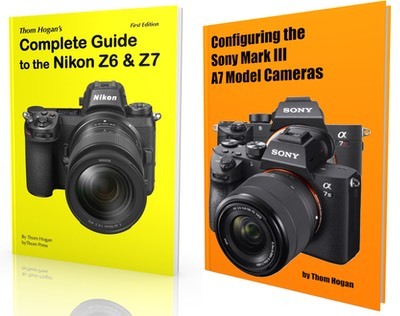 Sony today used the RX10 Mark III announcement to introduce two new lenses for their FE mount: the 50mm f/1.8 and the 70-300mm f/4.5-5.6. Article on sansmirror.com. 50mm f/1.8 data page. 70-300mm f/4.5-5.6 data page. Choosing a Simple Prime Kit. Lens month continues... Here’s the thing about using primes: you tend to think a bit more about perspective, because framing is dictated by your feet (moving position) more than your hand (zooming). Article on dslrbodies.com Updated: added “The DX Problem (Buzz Buzz) to the article ;~). Continued to clean up the f/1.8G reviews, including adding some additional field notes to some of the reviews, including focus shift and focus performance. The Nikon D5/D500 Blog. Link updated. Starting later today I’ll be starting to put up small bits and pieces about the D5 (and eventually the D500) as I start working with them and learn something of interest. This will be a dedicated page that updates whenever I learn more, so bookmark it and come back from time to time. If you have questions that aren’t answered by this page, by all means drop me an email and ask away. As I noted earlier in the week, I’ve introduced a few new elements to these reviews, and I’ve gone back and added them, as appropriate, to the other existing lens reviews. Moreover, I’ve separated the lens reviews into two sub-menus, one for Nikkor Primes, the other for Nikkor Zooms. Eventually, there will be a Third-Party Lenses folder, too. The Reviews page on this site has also been updated with ratings. More reviews coming. Be patient. This process is taking me a bit longer to catch up with because there are a lot of moving parts. Irix 15mm f/2.4 lens was added to the lens database. The Leica Vario-Elmarit 90-280mm f/2.8-4 has been added to the sansmirror lens database. DX Recommended Lenses was updated. FX Recommended Lenses was updated. Someone pointed me to a D810 predicted shutter life crowd sourcing effort. Unfortunately, this site has very little data, so isn’t very predictive at the moment. If you’ve got a D810, you might want to check your shutter count and enter your data. If you’ve had a shutter replacement on the D810, ditto. Actually, the site has data for a huge number of cameras, though again not always enough to predict well. So go to the shutter life index page and pick your camera and enter your data. A few of the older cameras have a base that’s just big enough to start to show the bell curve (e.g. D300). How two people got to 500k shutter activations on a Df impresses me. Isn’t that a camera for slow, deliberate shooters? ;~) Since I know someone will ask, aren’t the camera makers’ numbers MTBF (mean time before failure)? No. They’re not. They’re simply a slightly vague suggestion of how they’re tested. “Test to 100k activations” tells us nothing about expected failure rates, only that the camera maker based their quality decisions on data they acquired testing some unknown number of cameras to 100k shutter activations and achieving some unknown parameter in terms of failure. There’s an implication that “tested to 200k” is better than “tested to 100k”, but it’s only an implication. We’d have to assume that they performed the tests the same way and used the same metrics for their decision making, which might not be the case. Apropos of my article on price drifting yesterday, B&H now has the D610 body for US$1297 [Advertiser link] plus a 4% future purchase credit plus an SD card, extra battery, and shoulder case. Not considering the accessories, that’s nearly a 40% price drop (and that’s from a lower price than the introductory price of the D600). A new simple B&H Wish List for a few of you: D500 Welcome to XQD [Advertiser link]. I’ve gotten a lot of questions about what cards to buy. Right now, the items in this list are my go-to XQD choices on the D4/D4s. I’ve added short notes to each item in the wish list, as usual. Once I’ve been able to test shipping D500’s (and D5’s) I’ll update the list, if necessary. Remember: in Nikon cameras, the slowest card in the camera dictates camera speed if it is in any way active (e.g. active Secondary Slot Role on the D500).